Underneath the station we had underground tunnels and roadways, there was also a third of a mile of crawling tunnels 4 ft wide by 3 ft high. Ten stone dummies were used on the stretchers to drag through the tunnels. The Rescue apparatus weighed three stone carried on your back so there was not a lot of clearance under these tunnels. The difficult arose when you were getting out of the lower tunnel with the stretcher and dummy model. While doing this task the roadways were filled with thick smoke, a brazier was filled with anything they could get hold of that would burn, which was mostly cardboard. A fan used to pull the smoke through the tunnels and to the surface. 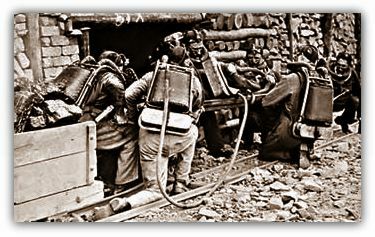 This training was essential because it was the only method of training in smoke filled roadways in the mines. The pit rescue teams appreciated this training for experience. When the rescue teams came back to surface their apparatus had to be dismantled and cleaned also the apparatus had to be dipped in a water tank to find any leaks on the apparatus. We also had a room adjacent to the liquid air plant where we had to empty clean out and refill the section of the apparatus that contained the caustic soda which was required to purify the exhaust air from the wearer's mouth. After a two hour stint in the apparatus this caustic soda would get solid, which was caused by the carbon dioxide leaving the apparatus and fresh air and oxygen being transferred back to the wearer. Other duties which had to be undertaken was clearing the vans out every morning cleaning the station window, stoking up the fire down below and painting and decorating. At the weekend every Saturday every room floor which were red tiles had to be scrubbed and all brass work cleaned and polished. We had our own locker in the changing room and near to his room were four showers and the toilets. Saturday morning was also the morning for cleaning our surface fire fighting clothing, all the brass buttons had to be polished and then they were inspected by the officers. With the mines rescue apparatus being used from Monday to Thursday all these had to be stripped down, valves checked cleaned and polished. Any leaking washers in the joints were replaced and everything was left ready for emergencies. The breathing apparatus in the vans were changed every Friday to make sure they alternated each week. 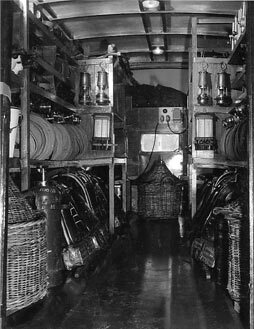 Before the workmen used the rescue apparatus the captain had to check all his team mates couplings and joints on the apparatus, all nose clips and mouth pieces checked which had to be properly in place. The apparatus were hung on scales and weighed before use, they were roughly 40-45lbs in weight. When the liquid air was put into the apparatus the weight should have reached 47-52lbs. Under private enterprise the rescue men could not joint a union, when the NCB took over we applied to joint the NUM, this action did not go down very well with the Manager and Superintendent. I used to take the money up to the Ramcoft Colliery union representative every month, At that time three new houses were built at the back of the station, this now meant we had nine brigade met and three officers. To my surprise one day the Superintendent shouted to me whilst I was gardening "Jamie when is your union money paid up to?" I told him and from that day our union money was stopped out of our wages. Mr Bert Wynne was the General Secretary of the NUM at that time which the offices were based at Saltergate, Chesterfield. I went to see him and he came down to the Station and sorted it our for us. There was on old custom we objected to and that was having to salute the Superintendent when being paid out wages. Mr Wynne came to the Station and had that stopped. He told the Superintendent that we were all miners and not the armed forces, all the problems were resolved. Wages at that time were low, I started work there at £5 per week plus 8 tons of free coal the next pay rise we jumped to £7.10s. Two years later we had a visit to the station from Brigademen from Boothstown Station, Manchester. Wages cropped up and it appeared that they were on Deputies pay equivalent to those working underground. I wrote a letter to Mr W Shepperd who was then the No 1 Area General Manager and also the Chairman of the Rescue Committee who used to meet once a month in the conference room upstairs. In the letter I asked for an increase in our wages for the brigade men, I stated that the Boothstown Station men were being paid Deputies money which was at least £3 more than we were getting. I let him know that we considered our efficiency was second to none. All the brigade men signed the letter and the Superintendent was asked to delivery it to Mr Shepperd. I was in the back of the Rescue van when I heard a voice shout, where is that Jamie. I got out of the van and he thanked me for the letter. He said does the NUM know that you were applying for an increase in pay, I told him no. He then said go to see Bert Wynne and tell him what you have done and I will see our Financial Secretary Mr Sharpe and we will get the wheels in motion. A month later we got a further in increase of £3 10s per week which we were pleased with. After I left they were not long before they were receiving Deputies pay.